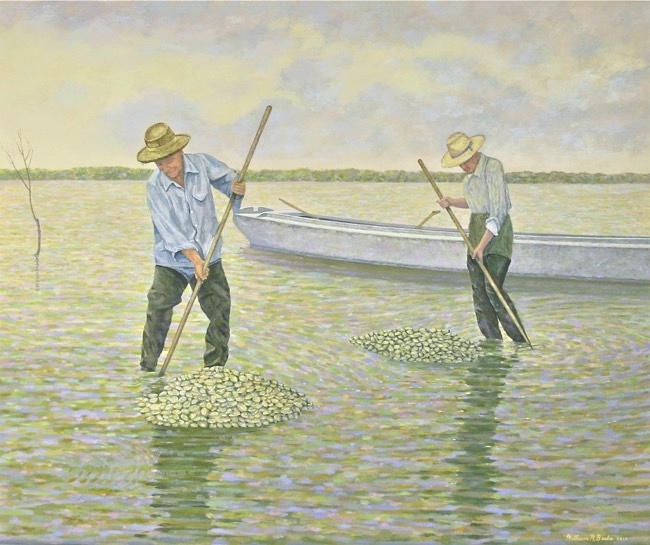 A Portrait of Watermen on the Chesapeake ~ Raking Clams! A number of years ago, I learned of a famous photographer who captured among other things, life on the Chesapeake. His name was A. Aubrey Bodine, and he worked for the Baltimore Sun newspaper for many years as a photojournalist. One day, a gallery owner showed me an old book of his photographs and encouragingly said, “You should paint something of Bodine’s!” The owner was carrying my maritime oil paintings and knew I was interested in painting scenes of the Chesapeake. After researching his work in several books and visiting the Mariners’ Museum (a tremendous resource for maritime reference material), I decided I wanted to pay tribute to A. Aubrey Bodine and paint the cover image of one of his books. First, I contacted his family in order to acquire permission to use his photographs for my artwork. His daughter reviewed my work and, fortunately, was flattered. She gave me full permission to use any of Mr. Bodine’s photographs as long as I gave him credit for the image. The Raking Clams image to me symbolized much of the “old” Chesapeake. Watermen working long, lonely hours fishing, oystering, or raking clams was how many made a living on the Chesapeake. Saltwater was in their blood. Learning from the generation before them, it’s all they knew. This was a portrait of a way of life, at a particular time, along a treasured body of water known as the Chesapeake Bay. I look forward to spending more time on the Bay, painting more maritime scenes from my own photographs, and maybe even painting another “Bodine” or two. Thank you for your interest in my journal and my art! I always appreciate hearing from you if you’d like to contact me or ask any questions. Please check back soon to read about what’s on my easel now or what's happening in the world of art! PS - The Mariners’ Museum is an excellent resource for anything relating to the old days on the Chesapeake Bay and much more. Their library is extensive and is located on the campus of Christopher Newport University, in Newport News, VA.